Kumalak is one of the most popular methods of fortune telling. It is governed by the principles of Persian form of geomancy. The chart formed after an in depth Kumalak analysis gives the relation that is present between the elements of the nature and the parts of the body. In the analysis of Kumalak chart one can predict the near foreseeable future by studying the location of coffee beans or pebbles on the Kumalak grid or cart. Kumalak, otherwise known as Qumalaq, is a very old method of divination. It originated in Persia and later on spread not only to Kazakhstan but also to the whole of Europe. It is studied on board game. The expert reader of Kumalak needs to posses some sort of psychic ability. This is because only with the help of psychic ability can one read and understand the implications of the positions of coffee beans. While doing a Kumalak analysis, a total of 41 beans are kept in a small. After this they are placed in a fixed design on the Kumalak grid, which is basically a 9 by 9 matrix where in each square is significant as it is related a fixed body part. 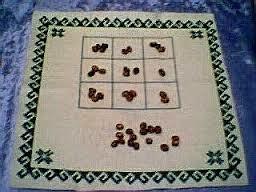 When finally placed the number of beans in a particular square also hold some significance. The grid is representative of the horseman of Kazakhstan. In the grid the first row stands for the past, the middle row is indicative of the present and the bottom row is reflective of the future. While practicing this form of divination one needs to stay focused and have the highest level of concentration possible. With the help of concentration only can one guess and interpret the Kumalak reading. In addition to all this there is this other requirement of a quiet and a peaceful environment. A Kumalak reading helps in achieving clarity and inspiration in the spiritual thinking. To use this tool all one needs to do is enter the name and then click on the button with ‘Free Kumalak Reading’ written on it. After this the grid appears with the destined number of beans in each grid. The report of this oracle also contains an interpretation of this chart. This fortune teller has gained a lot of popularity in the recent times because not only is it free and easy to use but it can be used from anywhere. In addition to all this one could verify the accuracy of their readings from the reviews of the past users. One must try using this calculator at least once and reap the benefits out of its results as so many other people are doing. Next What Is Candle Magic?